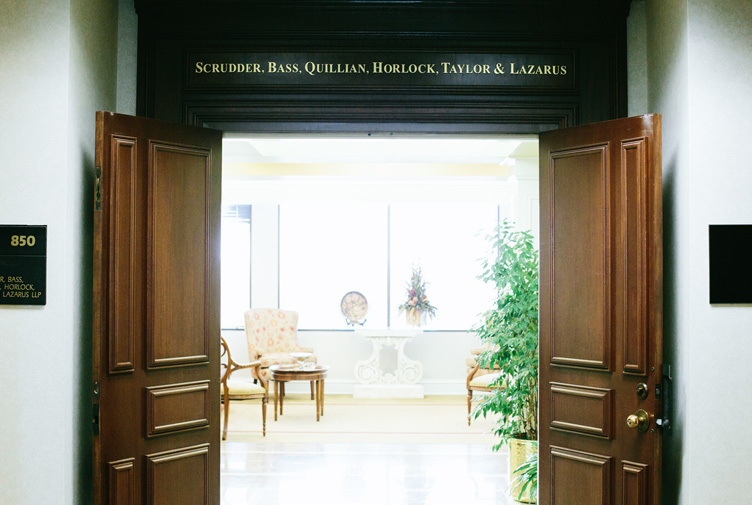 Scrudder, Bass, Quillian, Horlock, Taylor & Lazarus LLP is a civil litigation law firm that has served its clients for nearly three decades. Located in Atlanta, Georgia, Scrudder Bass has maintained a statewide practice representing individuals and corporations in civil litigation, dispute resolution, and administrative claims. As a result of the firm’s extensive litigation practice, its attorneys are highly experienced in all forms of alternative dispute resolution, including arbitration, mediation, and administrative practice. And while Scrudder Bass specializes in civil litigation, the firm routinely counsels clients on a wide range of matters outside the litigation context. The firm is listed in the Bar Register of Preeminent Lawyers and in Best’s Directory of Recommended Attorneys. Many of our attorneys are listed in the Bar Register of Preeminent Lawyers in the areas of commercial law, insurance defense law, civil trial practice, and personal injury law. Individual members are actively involved with the Defense Research Institute as well as the Georgia Defense Lawyers Association. The firm’s attorneys are licensed to practice in all state and federal trial and appellate courts in the State of Georgia. Individual members of the firm are also licensed in New York and South Carolina. Our attorneys’ diversity of experience brings our clients the balance of expertise and integrity needed to provide superior legal representation.